A glorious day! Fernando is finally home! 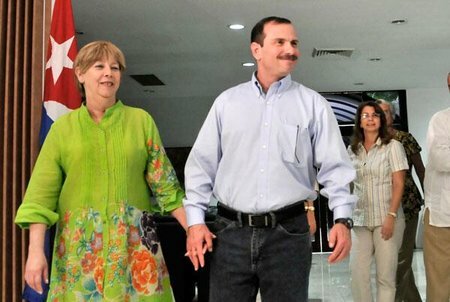 The National Committee to Free the Cuban Five is thrilled beyond words that Fernando González has already returned home to Cuba. We are absolutely joyful in seeing Fernando on Cuban soil, surrounded by his family, the Cuban leadership, and the Cuban people. We rejoice with Fernando and his family, while at the same time vowing to continue our efforts to free Gerardo Hernández, Antonio Guerrero, and Ramón Labañino from their unjust imprisonment. We repeat our demand as loudly as ever: Barack Obama, free the Cuban Five NOW! We reprint below an article and photo that just appeared in CubaDebate. We also provide links to two related videos. The antiterrorist fighter and Hero of the Republic of Cuba Fernando González Llort arrived in Cuba at noon today, after fully completing the long and unjust sentence to which he was subjected in the United States. Fernando is now meeting with his family, accompanied by Army General Raúl Castro Ruz, First Secretary of the CPC Central Committee and President of the Councils of State and Ministers, and other leaders of the Revolution. He left the federal correctional center at Safford, Arizona, yesterday and was made available to the immigration services to begin the process of deportation to Cuba. After René González, Fernando is the second of those internationally known as the Cuban Five that have finished their sentences. Fernando, René, Gerardo Hernández, Antonio Guerrero and Ramon Labañino were arrested in 1998 when they were on U.S. soil monitoring groups planning and executing terrorist actions against Cuba. The last three remain prisoners in U.S. prisons, despite a worldwide campaign demanding their release.